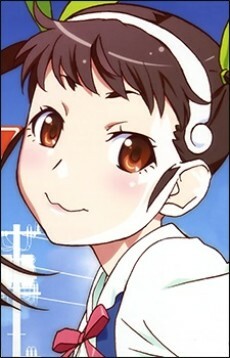 Mayoi is a fifth-grade elementary school girl. She always carries a big backpack, wears a hairband, and sports ponytails. Ten years ago she was involved in a traffic accident and died because of it. After that she became a ghost and considerates herself a "lost snail". She will unwillingly cause the people around her to become lost and unable to find their way home. The only people who can see her are people who don't want to go home in the first place. However, after Araragi and Senjougahara help her find the home she was looking for, she changed from an "earthbound spirit" to a "wandering spirit", a fact that she considers to be a bonus, as well as granting her to be free to wander wherever she desires. At the end of Nisemonogatari, she said goodbye to Koyomi, implying that she will not be seeing him again, which will be the basis of the next story, Mayoi Jiangshi. Her family name before her parents got divorced was Tsunade.